We often get asked by our patients why they may need to replace their silver filling if they are not suffering from dental pain. Ultimately, deciding what filling material to use to treat dental decay is a choice that must be made by you and your dentist. We’ve put together a list of 5 reasons why you should consider replacing your silver filling but first let’s understand the difference between silver fillings/dental amalgam and composite fillings. What is a Silver Filling Made From? Dental amalgam or silver filling as it’s commonly known, is made from a combination of metals that include mercury, silver, tin, and copper. Dental amalgam has been used by dentists for more than 150 years because it is long lasting and a cost effective alternative to other cavity-filling materials such as tooth-colored composites or gold fillings. A composite filling is a tooth-colored plastic and glass mixture used to restore decayed teeth. A composite filling is unlike an amalgam or metal filling, in that a composite filling is tooth colored to match the natural surrounding tooth in which it is placed. For cosmetic reasons. Composite fillings offer a natural aesthetic that shows no dark or metallic spots in the mouth like that of gold or silver amalgam fillings. Natural in appearance, composite fillings are also best suited to front teeth and other high-visibility areas. As with most dental restorations involving fillings, the procedure requires the removal of the decayed portion of the tooth before the composite filling can be placed. You may have a crack(s) in your filled tooth. Corrosion of the metal filling can occur over time. The expansion and contraction of the filling over the years can cause fractures in your tooth. A fractured tooth allows food debris, saliva and bacteria to get in and cause a cavity in a filled tooth. You may have a cavity under your silver filling. Did you know that cavities can actually hide under fillings may go undetected because they are opaque to x-rays? Just because a tooth is filled it doesn’t mean it is cavity free. At Premier Dental Care in Herndon our team uses x-rays to help diagnose the condition of the tooth, but we also use an intra-oral camera that helps us get a better picture of what exactly is going on inside. Your filling may be leaking. Over time as an amalgam filling breaks down, it can pull away from the tooth and lose it’s seal. That’s when the filling can begin to leak and allow food, saliva, and bacteria to enter your tooth which can cause damage to the tooth in the form of decay. It also causes less strength in the tooth and may make it more susceptible to fracturing. You clench or grind your teeth or chew on hard objects. Normal chewing in general put enough force on teeth naturally and over time can wear down your fillings. If you clench or grind your teeth this causes even more excessive force which cause fillings to breakdown faster. Do you chew on ice, pen caps or hard candy? If so, you can also impact filled teeth by putting more pressure on the tooth and filling than would normally occur. We often get asked is dental amalgams are safe and they are. The Mayo Clinic recently stated that dental amalgam is a safe and durable choice for dental fillings. 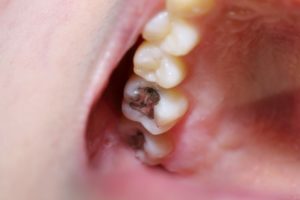 The major health organizations and associations say that dental amalgams are a safe and effective cavity-filling material. If you would like to learn more about dental fillings or would like to schedule your next dental appointment, please get in touch! Dr. Farshad Bakhtyari is the founder at Premier Dental Care located in Herndon, Virginia. Dr. Bakhtyari is a leading dentist around Reston, Herndon and Northern Virginia. Dr. Bakhtyari is an expert in general and cosmetic dentistry, is Invisalign certified and has gained a reputation of excellence in the dentistry community.